Recent strains in the funding markets bear watching. I have seen a number of explanations regarding the LIBOR/OIS widening, but I am no longer in close enough contact with those markets to offer any strong opinions. I would rather look at other markets, and see whether there is any sign of spread widening in sympathy. 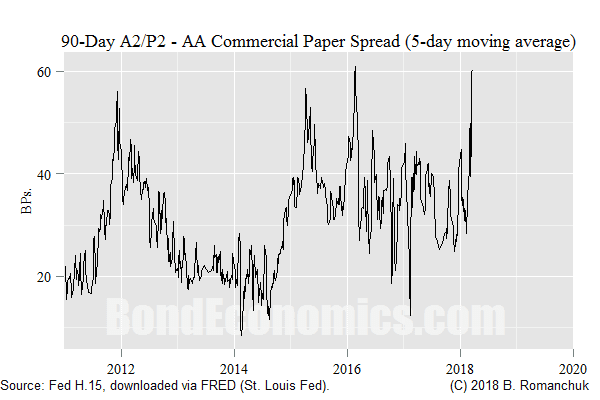 As shown above, the 90-day A2/P2 U.S. commercial paper spread has been widening relatively rapidly, although the spread itself remains at a level that it has hit a few times previously in the post-crisis era. One explanation I have seen has involved U.S. dollar repatriation flows that resulted from the tax cut. Such flows could conceivably have a localised effect on LIBOR funding costs, and this will then put some pressure on other short-term funding spreads. If repatriation flows are the culprit, it is not particularly concerning, as the spread would presumably revert once the flows stabilise. The real concern is that one or more levered entities are beginning to have funding problems. Since I am removed from the action, I am unaware of any particular candidates for that condition. In any event, that is the news flow that one should concentrate on, and not hand-wringing about technical analysis of the S&P 500. The spread widening itself is not large enough to cause problems. We are in the middle of a rate-hiking cycle already; any entity that is unable to absorb an extra 50 basis points of short-term interest cost was doomed in the first place. The absolute level of yields remains laughably low. There is no reason for the Federal Reserve to comment publicly about this spread widening. One hopes that they have a better idea of what is happening in the nooks and crannies of the credit system than they did in 2007 and 2008. However, unless they are certain that something is seriously wrong, they need to act as if everything is hunky-dory, and continue on their rate-hiking path. If there are entities that are beginning to have funding problems, it still seems possible that they can take actions to shore up their liquidity situation. In which case, we are back to looking at the state of the economy, and judging whether the tax cut will push some sectors into overheating.